Streets leading to Tan Son Nhat International Airport, Saigon Railway Station, Mien Dong and Mien Tay coach stations have been overloaded with traffic jam prolonging in HCMC. Early on February 8, vehicles moved very slowly from Hang Xanh roundabout to Mien Dong coach station. Xo Viet Nghe Tinh street has three lanes and all of them were occupied by automobiles forcing motorbikes to travel in pavements or squeeze among queues of automobiles. Adding to the woes, residents alongside the street encroached pavements to display Tet goods. Drivers took up to 30 minutes to escape the road stretch of less than one kilometer before facing another congestion in Highway 13 because of vehicles from Mien Dong coach station toward Binh Phuoc crossroads. In the opposite direction, traffic congestion took place from Pham Van Dong street to the roundabout near Binh Trieu bridge and extended to Dinh Bo Linh street, Binh Thanh district. The situation got worse in the nearby level crossing. On the same day, traffic jam started occurring in streets surrounding Tan Son Nhat International Airport from 11 a.m. Truong Son street was most congested. Thousands of vehicles must move inch by inch in Truong Son street from the airport to Hoang Van Thu Park. Traffic chaos was seen in the crossroads of Truong Son street with Hau Giang, Cuu Long and Pho Quang streets. Although traffic police force had been supplemented to regulate traffic in the area but travel was still very difficult. the situation did not improve by 1 p.m. According to Sai Gon Giai Phong Newspaper record, traffic jam in Truong Son street affected other streets such as Bach Dang, Hoang Van Thu and Cong Hoa. Not only occurring in the above areas, traffic jam was seen in the center area of the city such as Nguyen Thi Minh Khai, Cach Mang Thang Tam, 3 Thang 2 (February 3) and Nguyen Van Cu street. Badly snarl-up in Dan Chu Square roundabout, District 3 took drivers up to 15 minutes to escape from the area. Many motorcyclists traveled contrariwise towards Ly Chinh Thang street or moved into the pavement in Cach Mang Thang Tam street to reach the center area of the city. In District 2, container trucks and trucks following each other traveled slowly to Cat Lai seaport from 7-9 a.m. and 4:30-8 p.m. in Vo Chi Cong and Nguyen Thi Dinh crossroads. They were even stationary in Dong Van Cong street. Traffic police must guide vehicles to travel to Thu Thiem tunnel to reduce pressure for the area. 2. Cat Lai seaport area, District 2 comprising Dong Van Cong, Vo Chi Cong and Nguyen Thi Dinh street. 3. Truong Tho port complex-RMK crossroads in District 9. 6. Dan Chu square roundabout, District 3. The city Department of Transport has coordinated with police, youth volunteer force and relevant agencies to conduct many measures to ease traffic jam. However the volume of vehicles has highly surged during the yearend complicating traffic condition. The agency has advised residents to update traffic information before travelling. 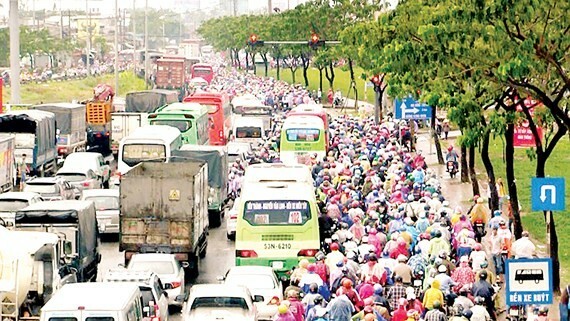 In Hanoi, residents have witnessed the worst traffic jam spreading city wide these days. 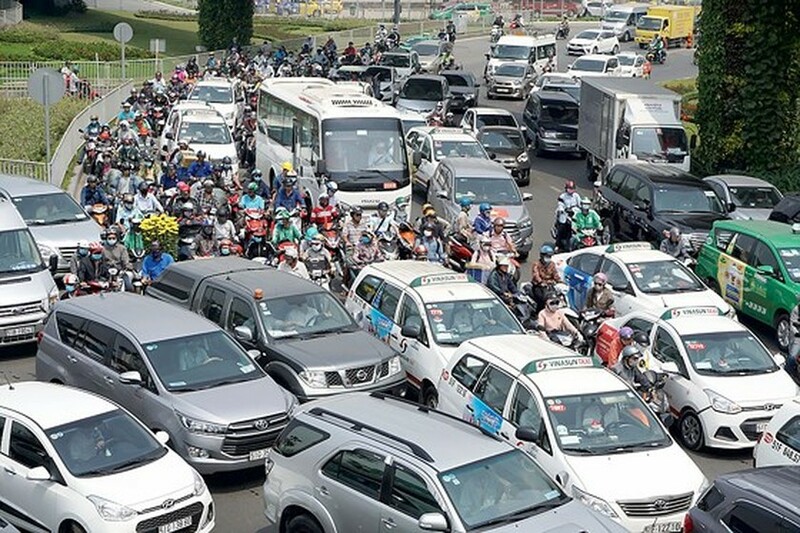 At present, Hanoi has 37 spots regularly seeing traffic jam during peak time and 24 pots in danger of congestion during the Lunar New Year festival. Still in fact traffic jam has found it occur in most streets in the city. The issue occured in city entrance routes such as Ring Road No.3, Giai Phong, Nguyen Trai, Pham Hung, Xuan Thuy and most streets to the center area including Trang Tien, Hai Ba Trung, Nguyen Thai Hoc, Pho Hue and Hang Bai. All lanes in these streets have been occupied with automobiles while motorbikes must travel inch by inch or move into pavements. 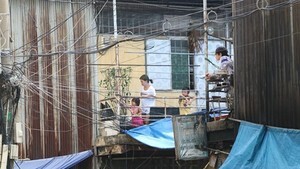 Although authorized agencies have spent billions of dong to clear pavements and narrow dividers in streets inner the city such as De La Thanh, Giang Vo, Xa Dan and Nguyen Chi Thanh but the situation has not been better. Representative from Hanoi Urban Traffic Management Center said that up to 400-500 vehicles must change their routes to avoid traffic jam a day for the last few days. During rush hours, buses are 30-40 minutes later than normal, travel in some trips prolongs to an hour. According to the Hanoi Transport Department, authorized agencies have implemented many solutions to cope with traffic jam, supplemented forces including ward police and activists to regulate traffic. However, traffic jam has been occurring because travel demand is too huge with the large number of people streaming to the capital city from other provinces and cities annually. In addition, the awareness of abiding by traffic law is not good worsening the issue. Severe traffic jams are forecast in the next couple of days with the surging number vehicles.